Has heavy, short-necked and pot-bellied appearance, comparatively short legs and bill, white underwing coverts and axillaries. Adult breeding is strikingly coloured black, white and golden; very contrasting in flight from below with white underwings and black belly; feet do not extend beyond tip of tail. Flight pattern above is rather uniform, dark brown spotted golden with faint wing-bar mainly shown in primaries, no white in tail. Non-breeding and immatures have faint yellow-buff supcrcilium. 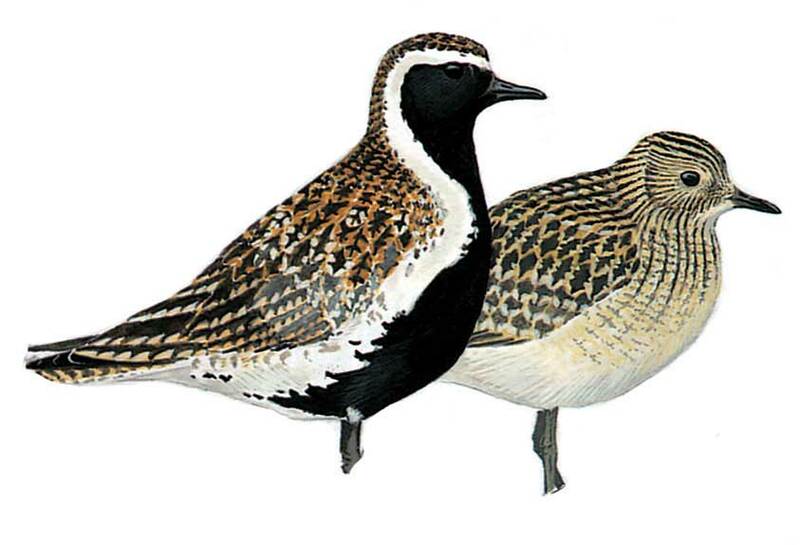 Larger Grey Plover has black axillaries, stronger bill, white rump and grey appearance.